Roscommon Integrated Development Company works to promote and engage in enterprise and community development and to facilitate rural and urban regeneration. We have an extensive reach in the creative sector at regional level and a strong network of local development contacts throughout Europe. Momentum brings a long track record of creative industries experience to the CCiC partnership. We specialise in the design and delivery of stimulating entrepreneurship training and have helped numerous communities set up innovative & creative workspace hubs. We are delighted to share this knowledge with the CCIC project. Akademia Humanistyczno-Ekonomiczna w Łodzi is one of the biggest non-public universities in Poland offering students a wide range of faculties and specialisations. Located in Lodz – City of Creativie Industries, has excellent collaboration links with the key creative partners in the city. 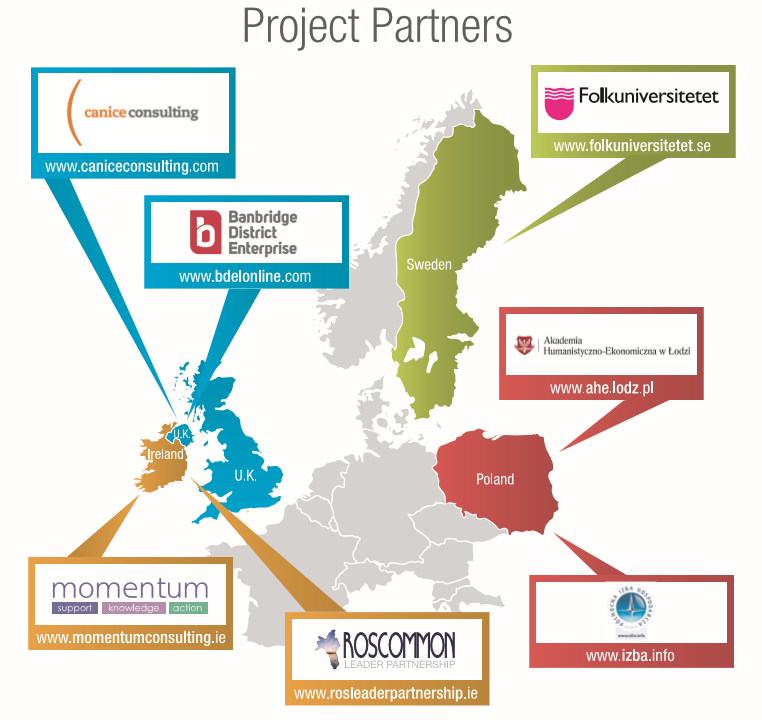 The Northern Chamber of Commerce has been working intensively to nurture innovation and growth in creative enterprises in West Pomerania since 2011, leading projects such as Learn Engage Create which promoted SME-University Collaboration in the Creative Industries. Canice Consulting is a Northern Irish consultancy with a long track record in economic development consultancy and a specialization in online learning and ecommerce training. They will use their pedagogic and technical expertise to transfer the course content into a multimedia training resource, easily accessible online and through mobile learning formats. BDEL “support the development of enterprise through a partnership approach between the public, private and voluntary sectors”. BDEL has managed numerous international projects including craft and creative businesses. BDEL are experienced providers of business education, coaching and mentoring to entrepreneurs. Folkuniversitetet is an adult educational association that offers a wide range of adult education all over Sweden and is an association of five foundations. Amongst a lot of courses and learning programs you also find programs for entrepreneur-ship and social enterprises.